Friday morning I pulled into the DFW area. My aunt and uncle live in Plano, so my mom drove down to stay there and watch my kids while I headed to Frisco for the Applique Getaway... Over 48 hours kids-free! After getting them settled and giving hugs, I was on my way! 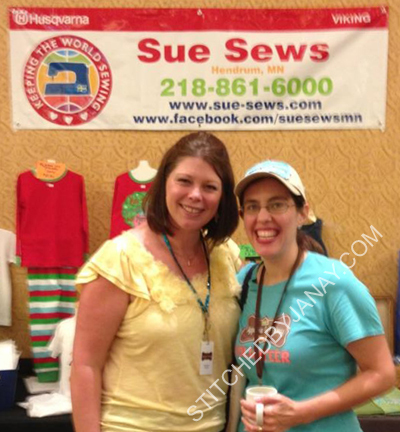 We decided to check out the grounds and ran into Whitney of That's Sew Grammy and Sara Ann of Pick and Stitch at the pool. 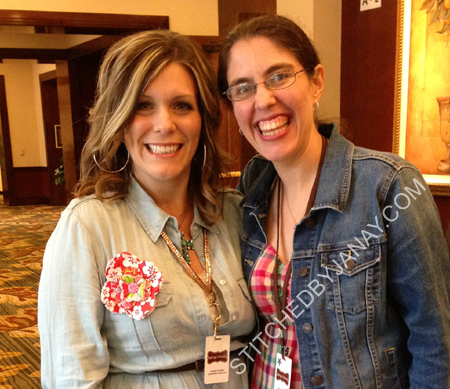 I ended up having several opportunities to visit with these two throughout the weekend, such sweet and down to earth ladies! and Rachel of Embroidery Boutique. I loaned Rachel a couple garden flags to add to her part of the sponsor digitizers' display. Towards the end of the night I met Nicole! Another gal whose blog I have followed for years. She is such a fabulous seamstress, I've often wished she lived next door. She taught a sewing basics class at AG. so they starting checking attendees in as they arrived, which was great --when the doors to the vendor room opened at 10am they could just walk in! 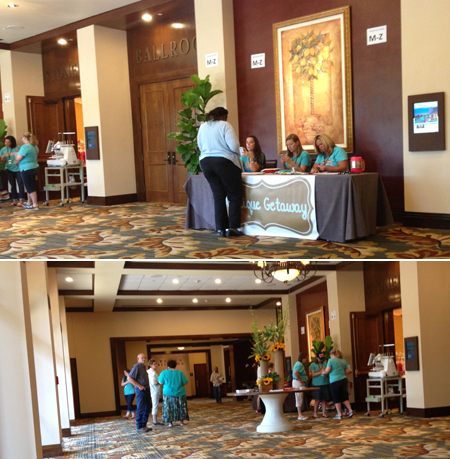 There was never much of a line at the registration tables, which was such a blessing. Here we are, ready to roll! 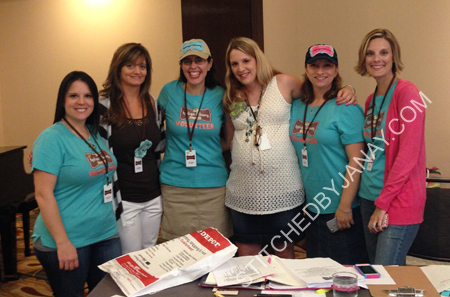 Chystyna, Cristy, Me, Lyndsie, Kaycee and Janna! When the classes started, I first volunteered in the class taught by Jennilee of DigiStitches. It was SO NEAT to meet her. I played gopher (running to find batteries, bags of ice...) grabbed some lunch, then and headed to my next volunteer stop, Lyndsie's class for single needle owners. Even though she has been doing embroidery for years and has a multineedle machine, she remembers her 4x4 single-needle days and still has a heart for those just starting out. She gave good tips for how to hoop challenging items and instilled confidence in those with machine limitations. Afterward I was able to do some troubleshooting with gals that have similar machines to me, that was neat! A little more gophering to help track down a missing software dongle :) and then I sat in on Lyndsie's digitizing demonstration. It was amazing to watch her create a design from start to finish, and confirmed that I'm just going to leave digitizing to the pros!! 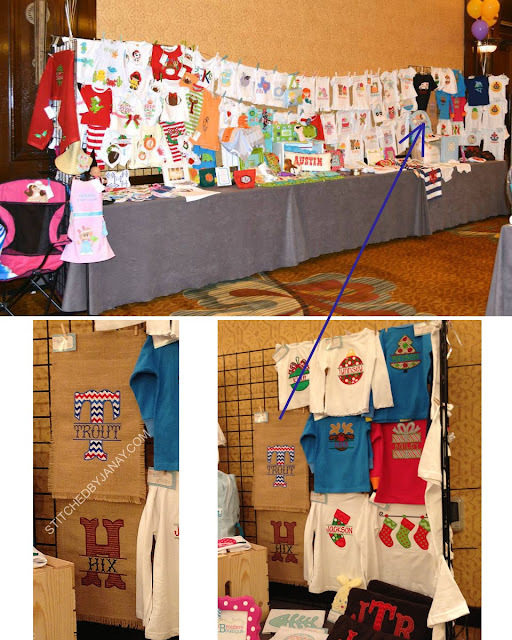 Throughout the day I did browse briefly in the vendor room. I avoided the machine dealers (no sense in drooling over things I can't have), quickly perused the blank suppliers (sadly Annaliese is now too big for the A-lines, ruffle pants and knit dresses I saw) and lingered in the fabric booths. I didn't go TOO overboard buying fat quarters from All Stitched Up by Angela and The Fabric Cobbler. The Meet-n-Greet that evening probably turned out to be my favorite part of the whole weekend. Yummy food and fun company! Towards the end of night I was sitting between Jennilee and Cristy, and around the table and at the next were more of my favorite digitizers and embroiderers! It was hard to not be totally star struck! 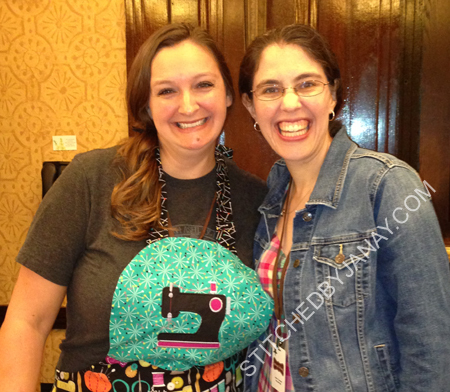 I got to talk to Whitney about a special digitizing project she is working on for me. 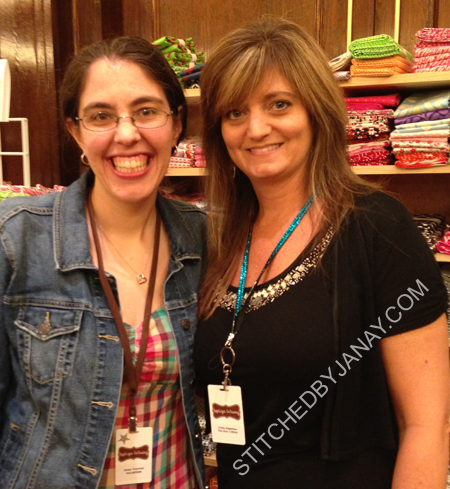 It was cool to be able to bring a couple of my test stitchouts with me and discuss progress in person. She is doing a valiant job on such a detailed request... can't wait to show off the final product when it's all done! 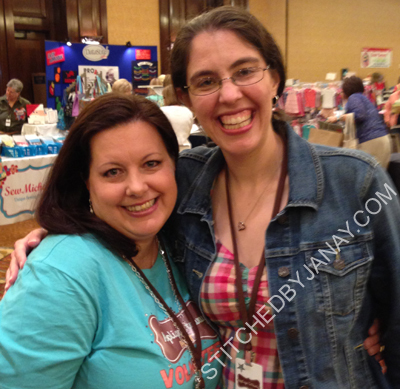 One of the gals around the table that I haven't mentioned yet is Sheila of Savvy Stitches. It was so neat to meet her! 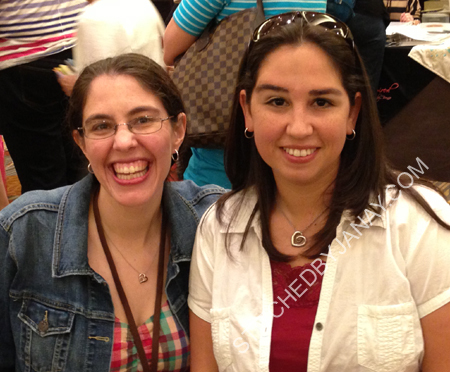 We "met" a few years back, both testers for LP and bloggers. We've participated in the same fb group, and been fans of each other pages. 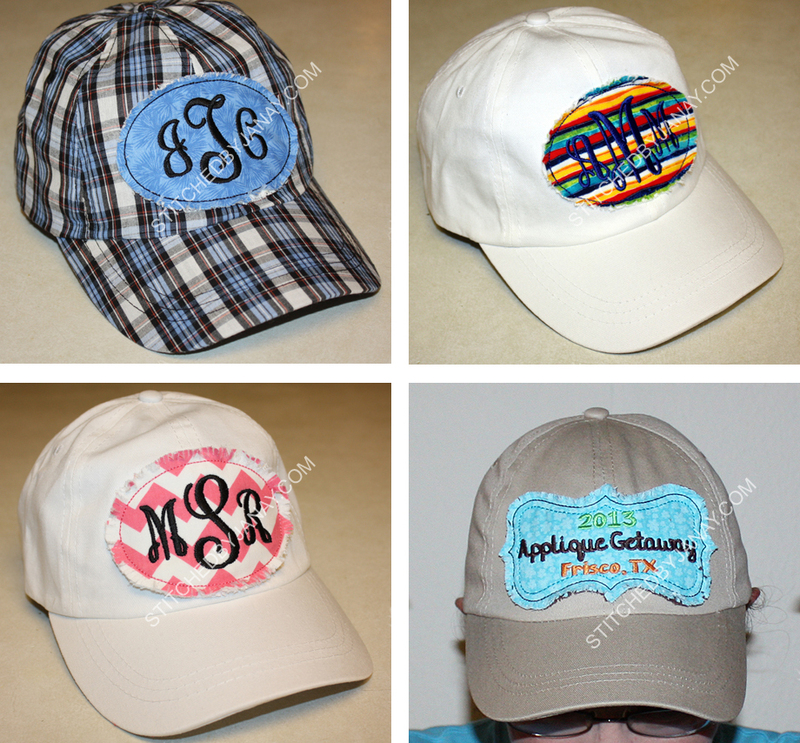 She's moved on to digitizing and I really enjoy the designs of hers that I've used. I was excited to meet her, but the crazy thing is she seemed just as excited to meet me! So fun! When the hotel employees kicked us out of the restaurant, we headed to the pool. I really enjoyed the time spent with Kaycee, Amy and Ivannia just chit chatting. 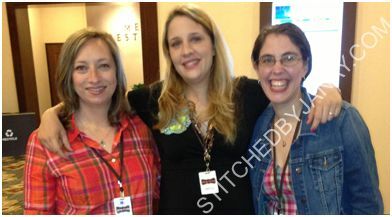 Also met three other girls who were there for the Getaway, too. 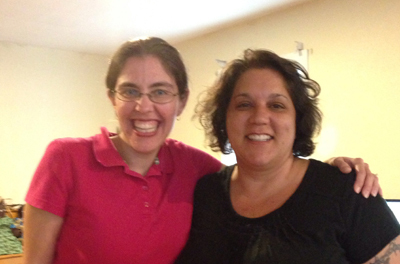 Here's a pic of me and Amy... she reminds me SO MUCH of a friend from my college days! 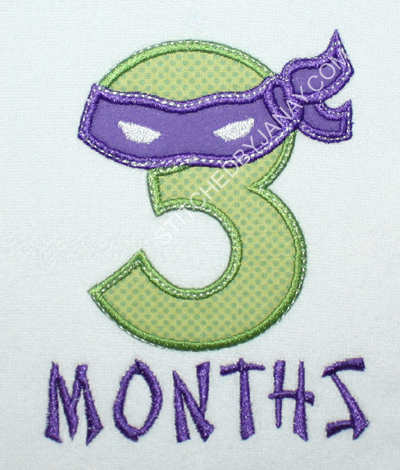 The second class I attended was Applique Innovations, sharing three cool products that you can use in applique projects, taught by Sue Sews herself and her daughter. They were a fun pair as well! After the class I spend some time browsing their booth. I didn't end up buying anything there but came home armed with a coupon to do some online shopping (they had actually sold out of some cool products demoed in their class). 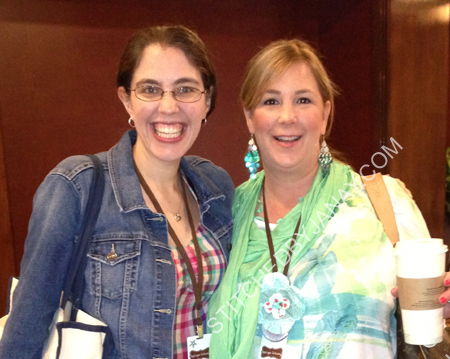 I got to chat a bit with Katie (one of Sue's daughters and EB tester) she's a sweetie! There was a lot of hustle and bustle at the very end of the day, the vendors had to pack up and get out pretty quickly. 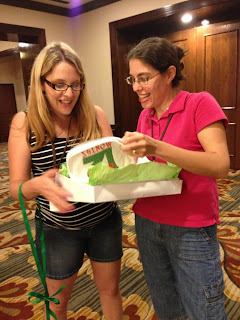 I chatted with Cristy a bit more as I helped take down Just Sew Pretty's display (Toby was still teaching. I never did actually meet her...) I helped Monogram Market pack up their booth and missed the final door prize drawings. No worries, Kaycee had my ticket number and it was never called. :) There were some amazing prizes that would have been fun to win, but really, interacting with all my online friends was prize enough! Macy's mom made an amazing cake to celebrate Laura's birthday, so I had a huge slice (aka my lunch) before giving final hugs and heading back to my aunt's house. Oh, hold on, there's one more little thing. 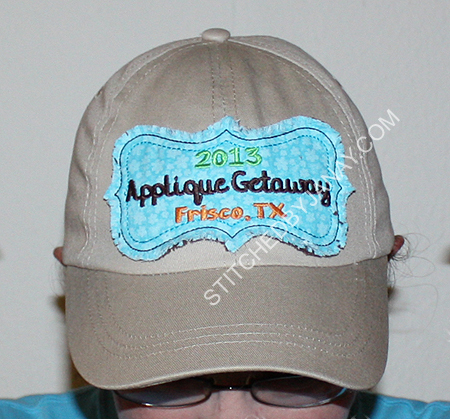 Another digitizer that I've become close to wasn't able to attend Applique Getaway due to their recent adoption, the timing just didn't work out for them this year. But my journey home from AG took me near their home, so I stopped by to meet Joe and Julie of 8 Claws and a Paw! We had a delightful time talking in person, and it was neat to meet all of their new kids. Whew! So there you have it! 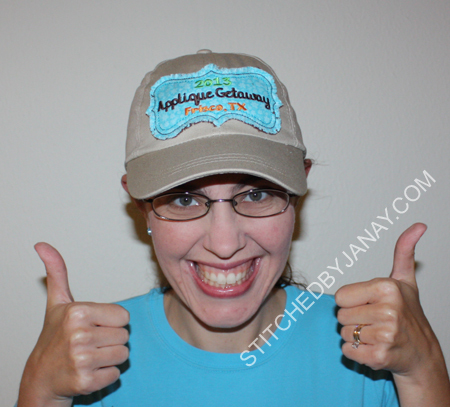 My Applique Getaway experience. I loved every minute of it. 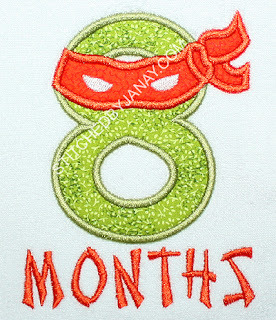 Have you ever had a fantastic idea eight days too late? I did, and BOY was I mad at myself!! I whined about it to a friend who encouraged me not to abandon the idea but get creative. I'm so glad I did, I LOVE how this turned out! 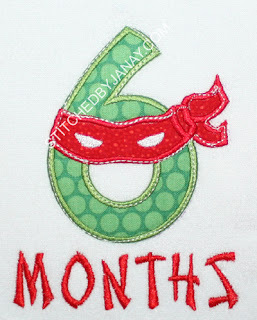 The Ninja Numbers are from Lynnie Pinnie, I've already blogged about them a bit here. When I had the opportunity to test the 4" #1 design, I put it on a bib thinking some day it could make a good first birthday bib for someone. 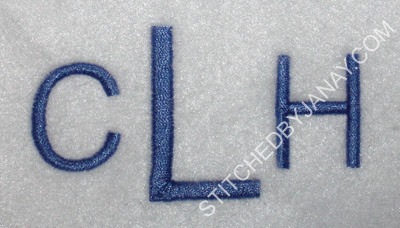 I wanted to test a few more, but had no project in mind, so I just stitched them on cutaway stabilizer. 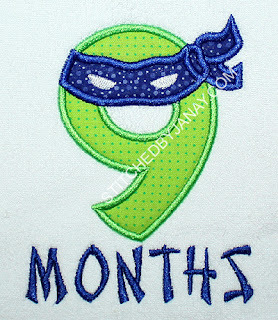 I had a passing thought of making them monthly milestones, but who would I give them to? I dismissed it pretty quickly. 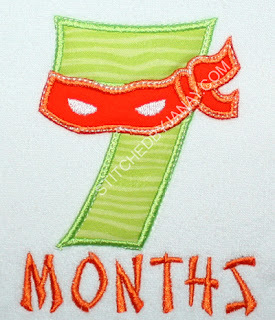 Then eight days later I realized I knew EXACTLY who I could give them to!!! Lyndsie of Lynnie Pinnie herself! She's due very soon with a little boy. 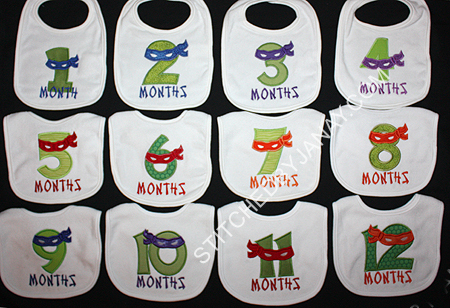 She digitized the set of numbers inspired by one of my projects, I tested them for her, and put them on bibs for her son! How perfect would that be?! 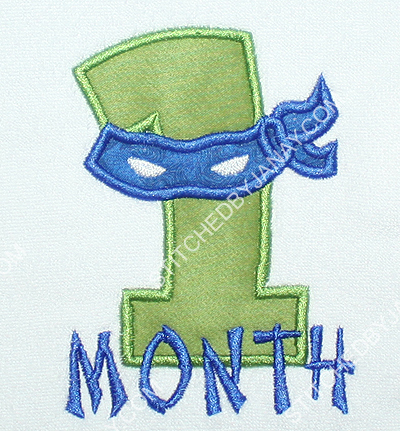 So I rehooped the #1 and stitched "month" across it. (I hadn't left myself enough space to put it below.) I used 8CP's Chinese Take Away for the text. Next I had to deal with the five numbers I had stitched on stabilizer. I first fused HNBL on the back. 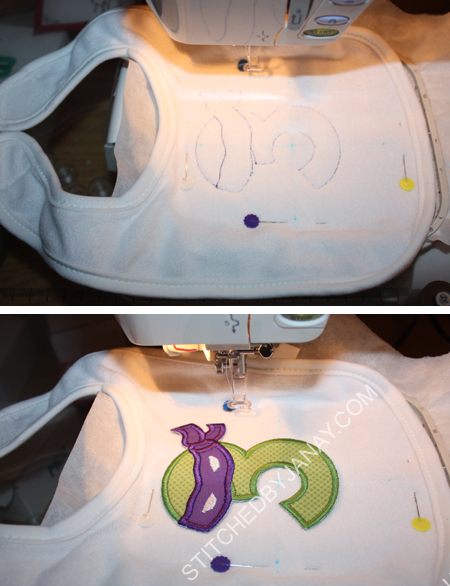 Then I carefully trimmed away the stabilizer as close as possible without snipping any of the satin stitches. Then I opened my software. 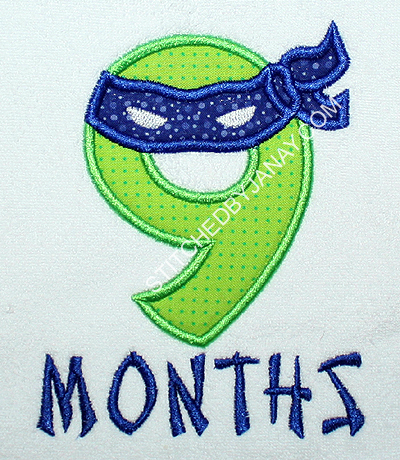 I deleted every element of the design except for the placement and tackdown stitches. I hooped bib, ran placement stitches, laid the number down as perfectly as I could, and then tacked it down. It wasn't as perfect as I had hoped, but it got the job done. 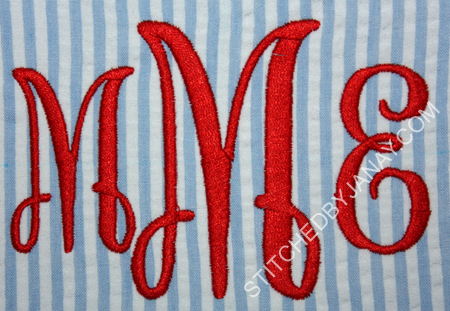 If I could do over, I would have taken the time to use matching thread instead of white (was thinking it would look like a cool top stitch, but that's only true if it's perfectly lined up ;) ). 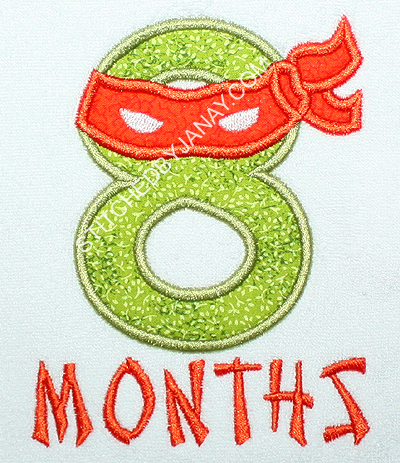 I stitched the word "months" under it. 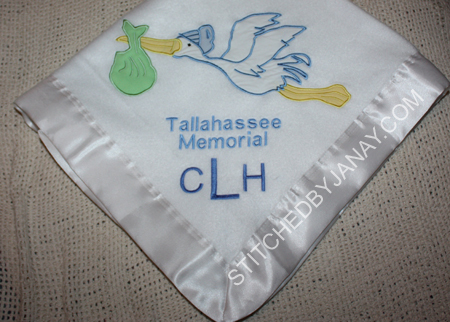 When it was done and cleaned up I pressed from the back to activate the HNBL fusing the design to the bib. Once those were done, I was halfway through! But 10, 11 and 12 required more work of course! 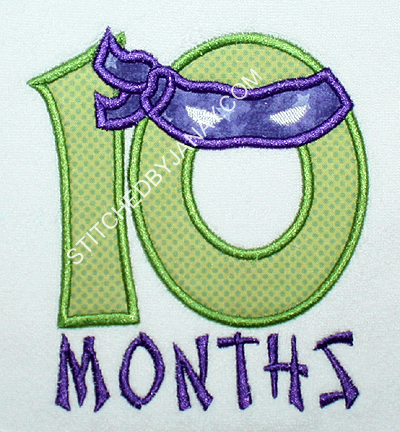 For #10, I used the #1 from 8CP's Big Applique set, and flipped LP's #0 so the bandana overlapped. 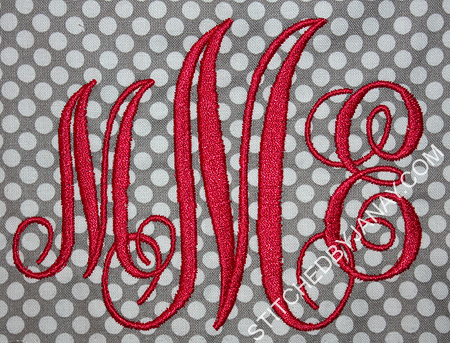 I did some design editing to remove underlay stitches. 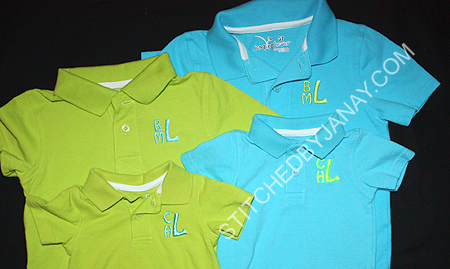 I would never let Lyndsie see the embroidery file (what a mess!) but the final product was great! 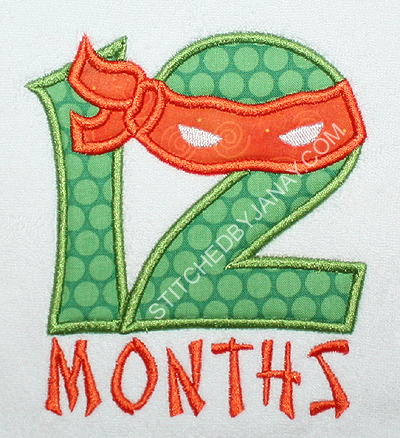 For #11, I couldn't use the #1 ninja number design, it just wasn't going to work the way the one was shaped. 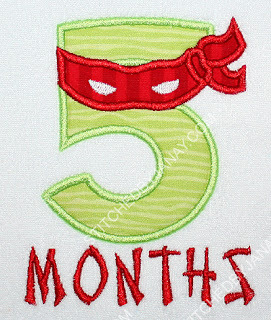 So I used two of the Big Applique 1's and put a mask over it. For #12 I started off making it like the #10 but quickly realized I couldn't simply mirror the 2 design to get the mask to overlap the 1, that made the two backwards ;) So I separated out the eye mask, mirrored it, and did some scooting/rotating to get it lined up as perfectly as possible. 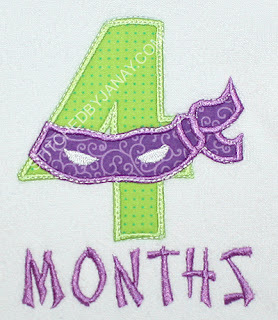 Now I can't wait to see the monthly milestones modeled once Jacoby arrives! This blog post comes to you while on a road trip! 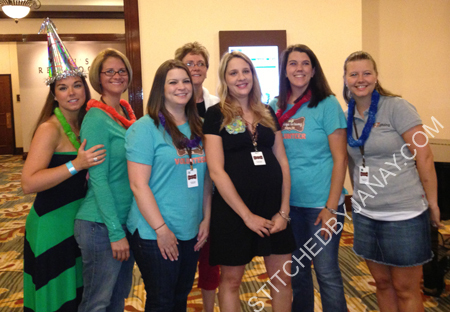 This past weekend I attended the Applique Getaway (which was a blast!!! More on that in a future post.) and I have gotten to visit a lot of family members. In anticipation of this adventure I made a couple garden flags. If you happened to attend Applique Getaway, you may have seen them in the vendor room among the sponsor digitizers' display with Embroidery Boutique's items (they feature her Split Tuscan Applique Alphabet). How cool is that?! 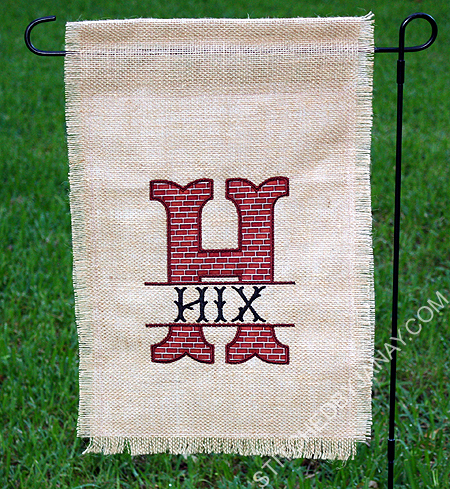 The first garden flag was for my aunt and uncle who live in the DFW area. They hosted my mom and kids while I attended the Getaway. I was SO THANKFUL for that, it made it possible for me to go! I was able to give this to them on their anniversary! I used 8CP's Tuscan Sun font to add their last name. The second flag was for my aunt and uncle who lost their home in the Moore OK tornado in May. 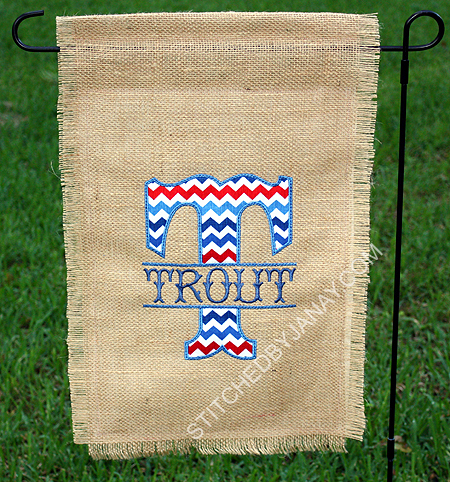 They recently closed on a beautiful home, and I was able to deliver this housewarming gift in person! 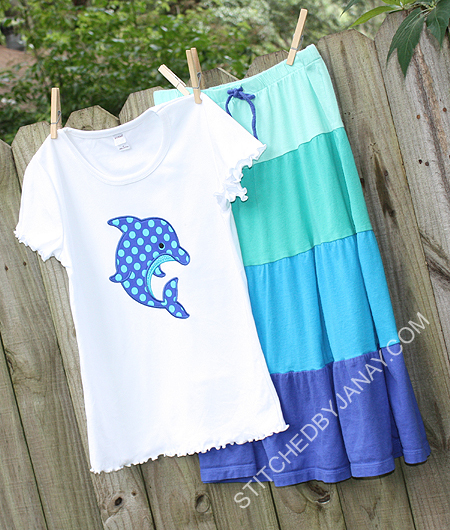 We bought this skirt last summer for my daughter and I have just been completely uninspired to make a shirt to match. A couple months ago we picked up this new 2013 MM Ta Dot because the colors were perfect, but it's just been sitting on my shelf waiting... until last week! 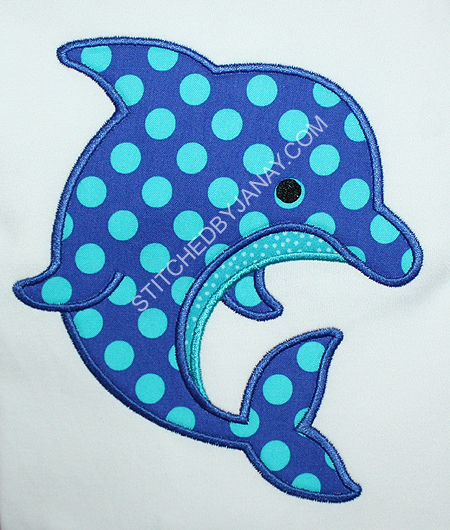 I had the opportunity to test this dolphin design for Embroidery Boutique. 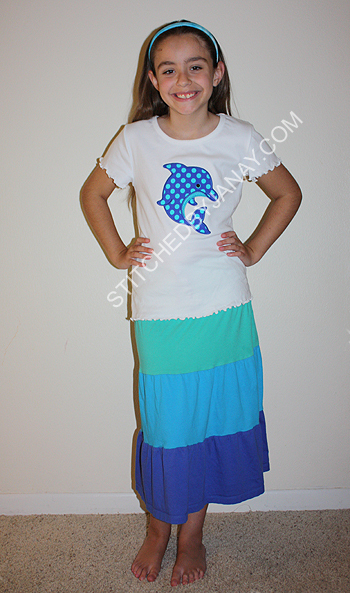 This design is simple, 2 fabrics, quick stitch. But it's perfect! 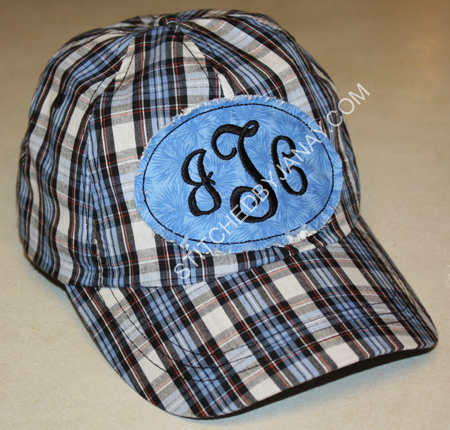 I jumped on the raggy patch monogram ball cap bandwagon a couple weeks ago, and am just now getting around to posting pictures. Still perfecting my technique, but so far I like them! 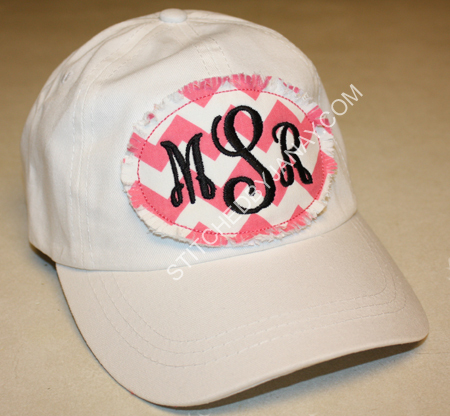 And this hat I am SUPER excited to wear LATER THIS WEEK at Applique Getaway! 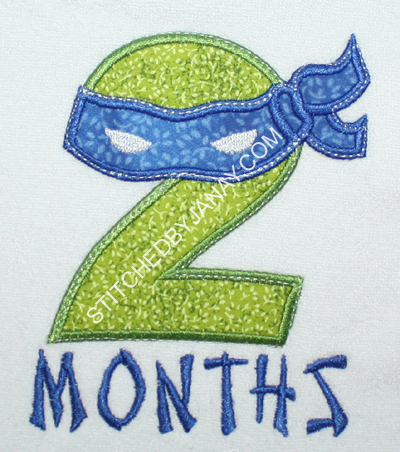 The coordinators provided an applique design of the logo, and when we arrive with it stitched on an item, we get entered into a drawing for an amazing prize! 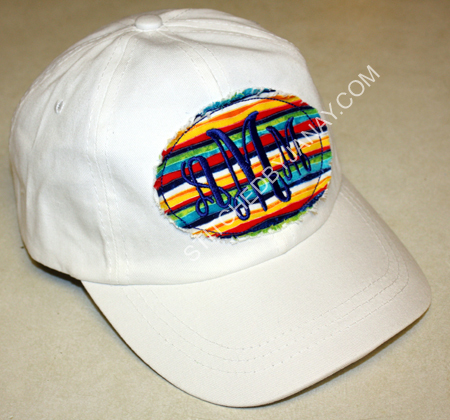 I decided to put the design on a hat, and I'm hoping the fabric I picked matches my volunteer shirt. I'll find out Friday! EEK! FRIDAY! 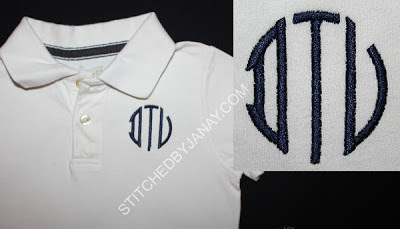 In general I really like the Natural Circle monogram, but the left D bugs me. 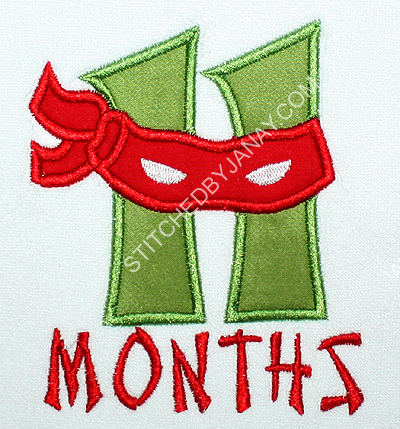 I've used it before for Dashiell, but now that he is older he probably would not accept the backwards D. The O actually looks more like a D, so I cobbled together my own mockup of a modified D and asked Itch 2 Stitch if she could create an alternative. I love the results!! 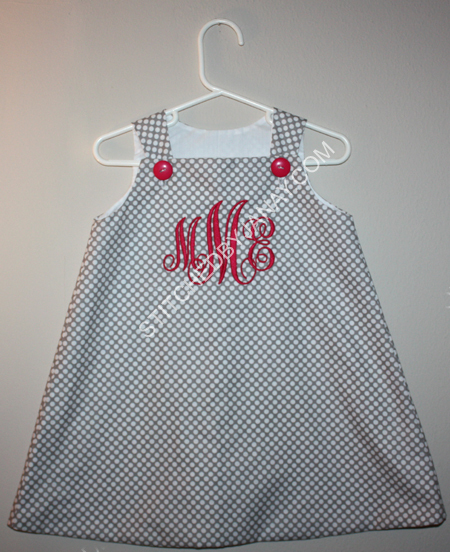 Tracy bought this cute dress and asked me to monogram it. She picked 8CP's Tinker Toy. It looks super cute on her! 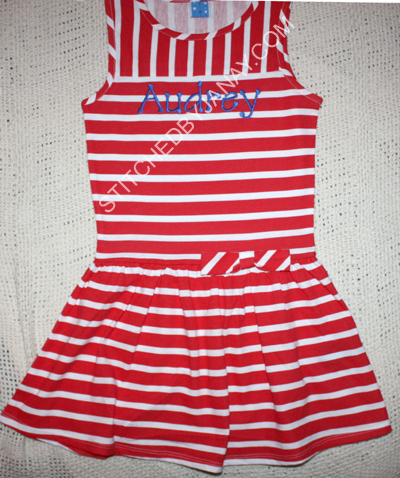 Stripes make me nervous, so to insure I didn't get it crooked I stitched a line on stabilizer, then attached the dress with spray adhesive and pins, lining up a stripe on the dress. Worked as well as possible! 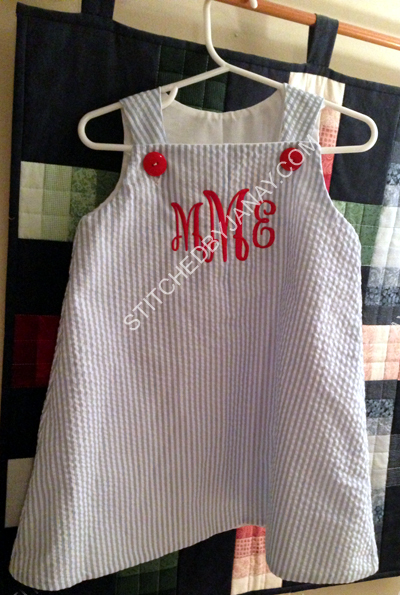 Katie made these adorable A-line dresses and asked me to monogram them. 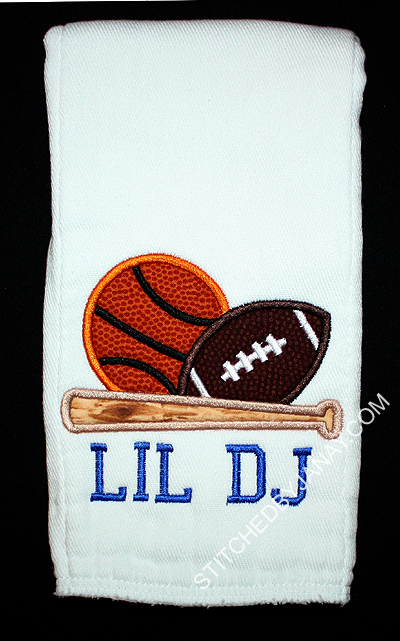 At Caden's baby shower, one of the hostess's mom had monogrammed several little items for a bunting on the mantle, such a cute decoration! 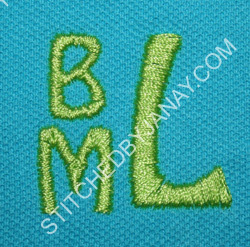 His grandma bought 2 matching polos for big brother Brooks and asked me to monogram them to match. I used Jolson's Hobo Mini font.